It is often said that a picture is worth a thousand words. Justin Thomas and Kevin Kisner proved that pictures are worth much more than that during last weekend’s PGA Championship. How long will the golfer be on screen during a tournament. Where should the logo be placed to maximize time, clarity, centricity, and prevalence on screen. 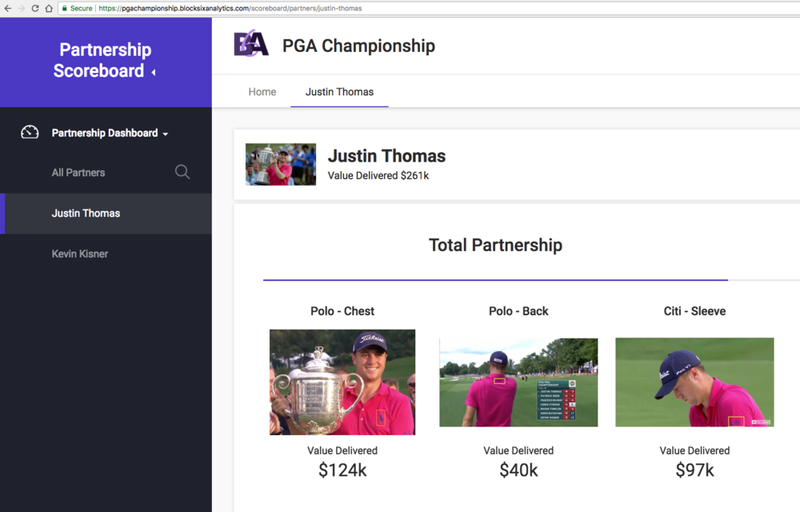 B6A used our Media Analysis Platform (MAP) technology to determine the value that Thomas and Kisner delivered during the final round of the PGA Championship. We picked Thomas and Kisner for specific reasons based on the two main considerations for maximizing partnership value. However, not all brand placments were tested in order to give a fair comparison for both players. The value in our analysis does not represent their total sponsorship value for the tournament. Thomas and Kisner took two different paths to the top of the leaderboard but both heavily and clearly featured their sponsors Sunday afternoon. Both Thomas and Kisner had multiple logos in different locations on the apparel they wore during the tournament. Thomas had two main sponsors on his shirt: Polo Golf on his left chest, right sleeve, and back, and Citi Bank on his left sleeve. Kevin had six main sponsors on his shirt: TaxSlayer on his right chest, EZ-GO on his left chest, BFS Group on his collar, Odyssey on his right sleeve, Wheelsup on his left sleeve, and Dunning on his back. For Justin, we tested the two Polo placements on his chest and back, and the Citi Bank sleeve ad. For Kevin, we tested the EZ-GO chest placement, the Dunning ad on his back, and the Odyssey sleeve placement. There are three main takeaways from our findings. First, the chest was the most valuable location for a shirt sponsor of the locations we examined. These logos were on screen far more than other spot and on-screen time leads directly to value. The Polo Horse on Thomas’ chest led the group in time, helped by multiple replays of his championship performance. Kisner’s chest sponsor, EZ-GO, led his shirt sponsors in on-screen time by a wide margin as well. Second, the size and clarity of the logo lead to significant differences in value. For example, Kisner’s bold, black EZ-GO logo against his baby blue shirt was easily visible on almost every shot of his chest. In contrast, Kisner’s Dunning sponsorship on his back collar was small and difficult to identify in a large portion of shots, leading to loss of value. Third, winning tournaments is significantly more valuable than just leading the tournament going into the final round. The Final Round is usually by far the most watched round of a golf tournament. Kisner’s two sleeve placements combined did not reach the total on-screen time of the Citi placemt on Thomas’ left sleeve during the final round. Thomas’ back-of-shirt logo also received much more exposure than Kisner’s placement getting five times the on-screen time in the final round. In real estate there is a famous saying that three most important factors in determining value are “location, location, location”. This applies to the real estate that corporate partners should evaluate when looking to maximize their relationships with golfers. Thomas and Kisner demonstrate how securing the best locations that maximizes quantity and quality of exposure is the key to generating the most value.